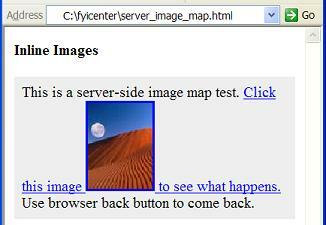 A server-side image map is an image inside a hyper link. The image must be defined with the "ismap" attribute in the "img" element. When a server-side image map is clicked in a browser window, the mouse coordinates will be delivered to the server by them to the end of the URL of the link in the format of "?x,y". This is a server-side image map test.